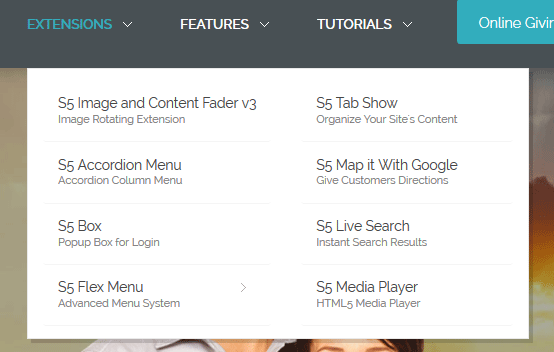 The S5 Flex Menu system is a very powerful plugin that provides functionality far beyond what the standard Joomla menu system can provide. 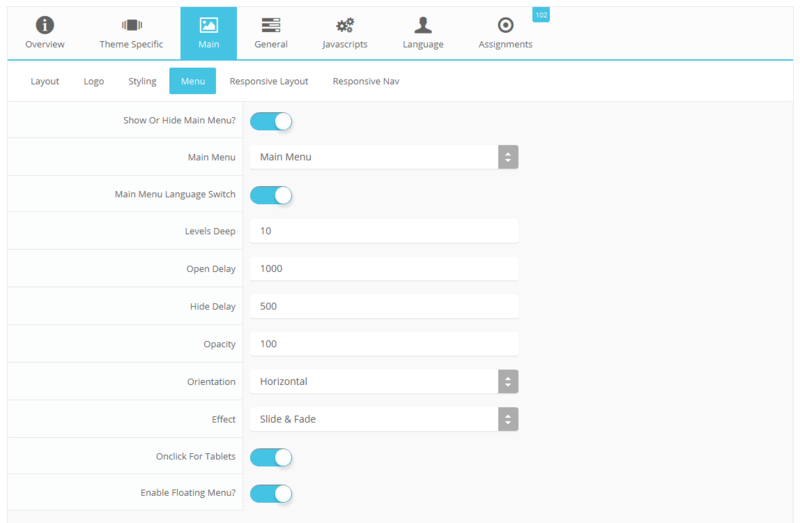 This plugin is intended to be as an extension of the existing menu system in Joomla to add many new features. This plugin may only be used with Shape5 templates specifically designed with the Vertex framework. If you have installed a Shape5 template using a site shaper the S5 Flex Menu plugin is already included and installation is not necessary. If you have installed a template into an existing Joomla installation then installation is required for the menu system to perform correctly. The plugin can be downloaded from our Free Extensions downloads area. 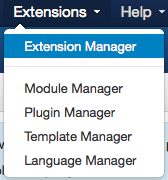 In Joomla's backend navigate to Extensions/Extensions Manager. 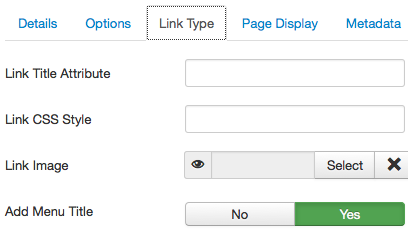 In the backend of Joomla navigate to the "Menus" item across the main menu. Once on this page edit the menu of your choice. 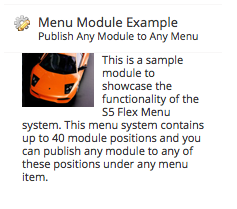 The parameters for the S5 Flex Menu will be shown in the backend of any menu item. Simply edit any menu item. When you have entered the edit screen of a menu item you will see a section of parameters on the right side of the page in an accordion style, each with their own titles. The S5 flex Menu settings are found under "S5 Flex Menu Parameters". 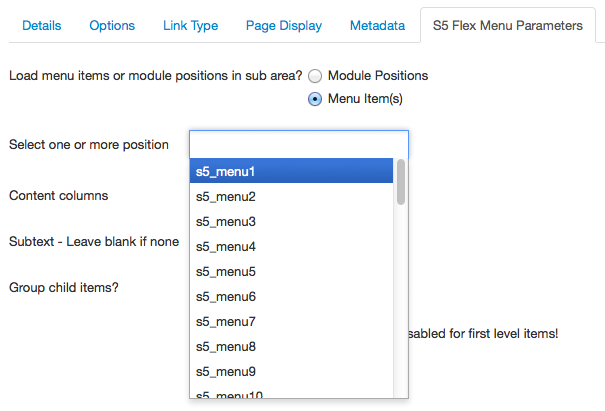 This section will control how you configure the S5 Flex Menu. The steps below will teach you how to use each of these settings. The number of columns shown in a sub menu is controlled by its parent. For example in the picture below you will see four sub menu items shown in two columns. This is because the parent item, "S5 Flex Menu", is set to show two columns in its configuration. Below we see how the "S5 Flex Menu" item is configured to show two columns. Below you can see that you have the option to display either menu items or modules in the sub area of a parent menu item. 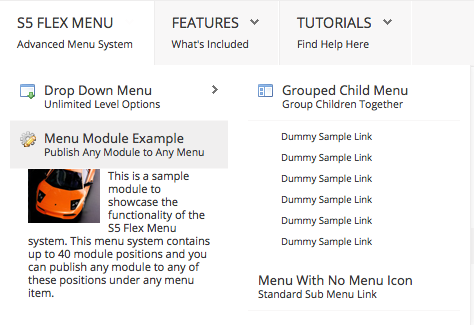 By default a menu will be set to show menu items as their children, however, you may also load module positions as their children. 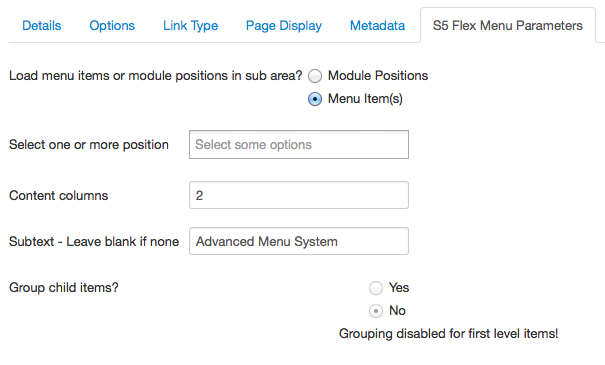 To do this simply select "Module Positions" and then select a position from the select area below that, ie s5_menu1, s5_menu2, s5_menu3, etc. Once you have selected a module position to load in the sub area simply publish any module to that position from the module manager. Below is the configuration of the menu item "Menu Module Example"
All that is needed then is to publish any module to the s5_menu1 position (or whatever position you choose) from the module manager area of Joomla. Children may be grouped or non-grouped from their parents under the parameter "Group child items?". You may group either menu items or modules. Grouping simply means the children will show in the same area of the parent rather than a new fly out window. You may group modules or menu items. Sub text can be added to any menu item. It is very easy to setup, simply type the sub text into the parameter below. If you do not wish to have sub text simply leave this parameter empty. Please note that some themes do have an option to disable subtext under the Theme Specific tab of Vertex. 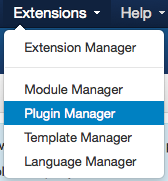 Menu icons are controlled through the default Joomla menu system. Open the Link Type Options tab and choose any menu image. Images are called from the images/stories folder. 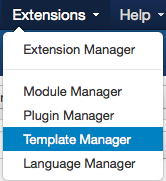 Once on the template manager page open your template's link by clicking on its title. This will bring you to the template configuration page. You may adjust these settings to your liking. Below is a definition of each parameter. Levels Deep - This number controls how many levels deep you would like the sub menus to appear. Any sub menus after this number will not appear. Orientation - Set the menu to horizontal or vertical. Vertical should only be used if the template has been specifically designed for this layout. Effect - Choose how you would like the sub menus to enter the page. Onclick For Tablets - The menu will automatically switch from hover to onclick calls if the device is a touch screen device smaller than 970px.